Our three- to four-year-old early preschool classes are specifically designed as the introduction to our pre-kindergarten Reading Readiness Program. In doing so, we have created an age-appropriate “perfectly balanced” curriculum to achieve our educational goals. 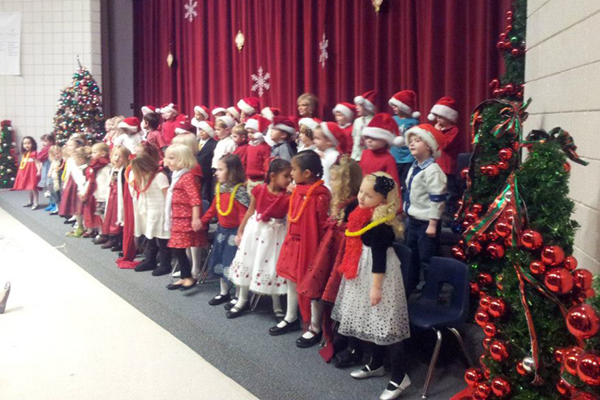 If you walk into our school during singing time, your heart will be filled with joy! It will bring a smile to your face when you hear the children’s singing voices fill our school with happiness and love. We sing alphabet songs, theme songs, action songs, and many other fun and exciting melodies. Music inspires children and sets the mood for our day of learning! Three- to four-year-olds are developing their eye-hand coordination and small motor muscles. This is achieved through the opportunity to cut, glue, paint, color, trace, draw, scribble, and be messy. Creativity and positive direction from our happy, loving teachers instill the desire and love for artistic endeavors. Indoor and outdoor physical activities and exercise is a must for healthy children. 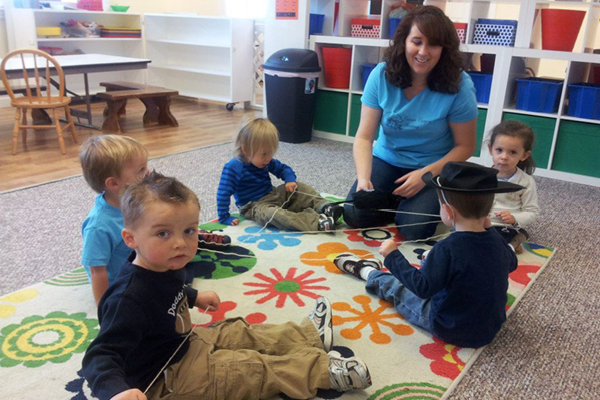 Physical awareness and development is achieved through stretching, balancing, throwing, catching, bouncing, creative movement, and role play to music. We believe it is important to engage in these activities, even during our cold winter months. 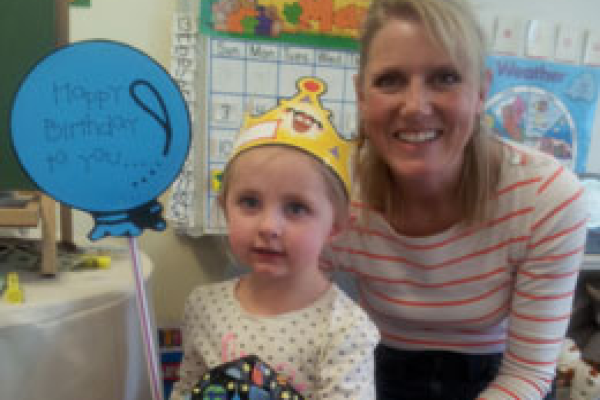 Numbers are essential in our preschool curriculum. We introduce age-appropriate math concepts with number recognition, counting, writing, sorting, and grouping. We reinforce all of these concepts throughout our preschool day by counting the letters in the alphabet, the days of the week, and other items in our classrooms. The children have ample opportunities for hands on experiences in sorting and grouping. These concepts give them the foundation for understanding and participating in early addition and subtraction. 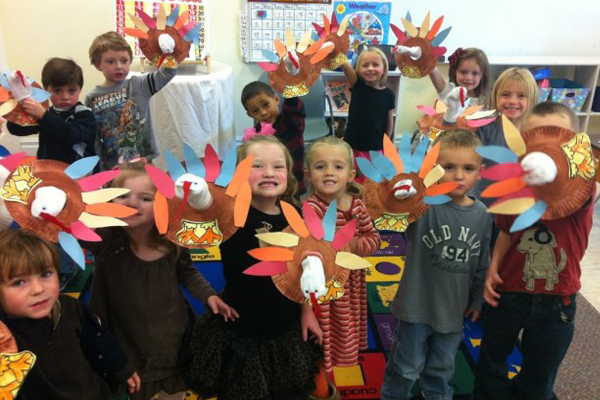 Our strong academic program begins with the three- to four-year-old curriculum. When children learn to read with a strong base in phonics, they will have the skill to be excellent readers. Our ‘stepping stone’ reading program begins with sight, sound, letter recognition, and writing. Much of our school day is coordinated around our reading skills. We work on both the upper case and lower case alphabet. The purpose of this program is to prepare our students as they move into the pre-kindergarten program, where they learn blending, diagraphs, and other principles of reading. We read many different types of books pertaining to the world around them as well as books that align with areas of study for the week. Our lessons, crafts, music, math, P.E, snack time, and field trips all tie in together to create the ultimate learning experience for our children. All teaching aspects are planned carefully to prepare our three- to four-year-old students to enter our four- to five-year-old pre-kindergarten reading program. Our field trips are chosen specifically to enhance the units of study in our school. Parents always accompany our children on our field trips to ensure safety and serve as fun support for the children. Participating in a hands on experience with their child enables parents to encourage them to share new experiences and knowledge they have gained with the entire family. The field trips also create an opportunity for parents and students to meet and mingle with other preschool parents and students. 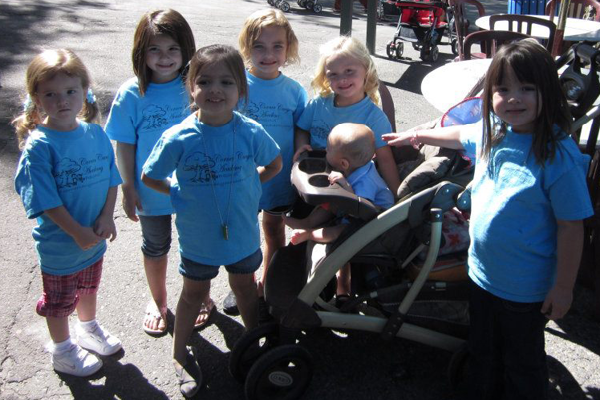 Many friendships are created and nurtured through our preschool field trips! Your three- to four-year-old children will be involved in a Halloween performance and parade in October. They will also be putting on a Mother’s Day program in spring. This gives the children an opportunity to demonstrate many of the things that they have learned for their family and friends. This is a fun opportunity for your child to participate in a fun, safe, encouraging, and character-building experience with their peers.